In her career in Colombia's anti-narcotics police force, 'Sombra' (Shadow) has sniffed out an unprecedented amount of drugs, but now this police dog has had to change her area of ​​operations to be safe after she was threatened. According to the Colombian press, intelligence sources claim that the criminal gang of the Gulf Clan (previously called Los Urabeños) offers a reward of 200,000,000 pesos (US $ 70,000) for the head of the German shepherd. The reason: the dog discovered more than five tons of cocaine from the criminal group and with the discovery managed to stop the shipment of the drug to Europe. The Gulf Clan is considered the most powerful criminal organization in Colombia. Much of the drug trafficking in Colombia is controlled by this criminal group and its leader, Dairo Antonio Úsuga, known as Otoniel, is one of the most wanted men in the country. Sombra was transferred from the area where the group operates, in Turbo, Antioquia, to the El Dorado airport in Bogotá. It is considered that the airport is a safe place for Sombra, since it is outside the main influence zone of the group. The police assured that it will not run any risk. Apart from her usual trainer, the police dog will now also be accompanied by more officers to increase her security during her deployments. Sombra, six years old, has been in the counternarcotics force since she was a puppy and has been distinguished for two consecutive years with the medal "Wilson Quintero" for her "invaluable contribution" in the fight against drug trafficking in the country. The anti-narcotics police said that Sombra has become "the terror" of criminal organizations and that's why they are looking to kill her. The dog helped the authorities in ports on the Atlantic coast, including the city of Turbo, where tons of drugs are shipped in speedboats and sometimes by submarine to the United States and Europe. In June, Sombra discovered 5.3 tons of cocaine in Turbo and later found another 4 tons hidden in auto parts that were also going to be exported. As reported by the Colombian media RCN, it was the police director, General Jorge Nieto, who ordered the transfer of Sombra to the Bogota airport, where Sombra has already achieved significant drug seizures. 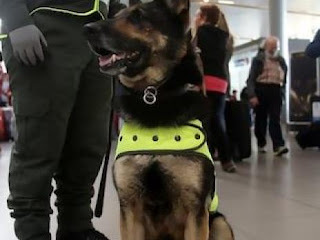 "Her intuition has allowed the capture of more than 245 people at airports such as José María Córdova, in Rionegro and El Dorado, in Bogotá," Colonel Carlos Fernando Villareal, head of canine training for the anti-narcotics police, told RCN. "In this last one (airport) she will remain until new order, since her presence has allowed to frustrate the exit of several loads of drug".